(ABU DHABI) Gulf Air will resume flights to the United States as well as some European destinations in the latter half of 2003 on the back of strong third-quarter passenger and cargo figures, the airline said. 'Our strong performance sets the scene for the next phase of our expansion strategy,' vice-president Farid al-Alawi said in a statement on Sunday. 'In addition to the recently announced resumption of services to Sydney and Athens, we intend to resume operations to the USA in the latter half of this year and add still further key destinations in Europe to our network,' Mr Alawi said. 'Despite the enormous challenges of the Iraq crisis and the outbreak of Sars, Gulf Air is on track to meet its financial targets and to fulfil its obligations to the board and its three owner states,' he said. 11 Countries. 17 Destinations. 172 Flights a week. Gulf Traveller offers you a wide selection of exotic destinations and the opportunity to experience the unique personalized service of the Middle East's first all-economy, full service airline. For details contact your local travel agent. 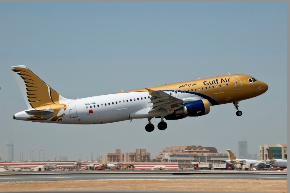 Founded in 1950, Gulf Air is the national carrier of the Kingdom of Bahrain. Despite fragmentation from its halcyon days when it also served as flag carrier for the UAE, Omanand Qatar, it remains one of the larger airlines in the Middle East region, serving over 40 destinations across Africa, Asia and Europe from its main base at Bahrain International Airport. However, it is having severe problems adjusting to the new highly competitive environment, based in a small O&D market and continues to incur large annual losses. by Capa Aviation.